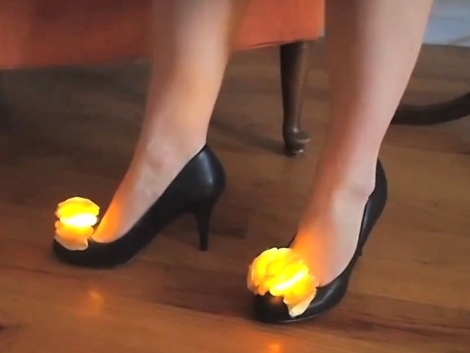 Whether for fashion, emergency lighting, or just to make a statement, these lighted shoe clips make for a unique footwear accessory. [Becky Stern], who we’ve seen before hacking automatic knitting machines, tackles this quick lighted project. The electronics are simple, two LEDs connected in parallel to a button battery by some conductive thread. The circuit is the same as an LED throwie, but she’s using a sewable battery holder. The ruffle is made by cutting out and folding several circles of fabric. We’re not too used to working with this building material and were glad to hear her tip on fusing the cut edges with a lighter. She’s also got a good tip about bending one LED lead in a square shape and the other in a round shape to keep track of the polarity. After sewing everything together and completing the circuit with the conductive thread [Becky] adds a paper clamp making this easy to use with any shoe. In fact, the guy’s don’t have to miss out on the fun as this could easily double as a boutineer. Don’t miss [Becky’s] complete walk through video embedded after the break.